This month I simultaneously listened to Jen Pollock Michel’s Keeping Place: Reflections on the Meaning of Home and paged through Ryan Pemberton’s Called: My Journey to C.S. Lewis’s House and Back Again. It was a fascinating combo platter. Both Michel and Pemberton found themselves far from their places of origin and longing for home. Both explore the geographical cost of discipleship. Both use story to tease out theology. And both were terrific. Having just returned from Oxford (Pemberton’s stomping ground) and having so recently published a book with the working title “Homesick” (ultimately Thirty Thousand Days), I couldn’t not read either of these books. Indeed, there were so many familiar moments in each one that a fly on the wall might have heard me yelp in recognition. Here is a teaser for each, for those of you looking for your next good read. Be sure to check out the links to their respective websites, too. Keeping Place. As one who is demonstrably preoccupied with Home and homesickness, I loved this book. Michel’s depth of historical study and the fascinating connections she makes between ideas and moments in time are so impressive. She writes like a scholar but not necessarily for scholars—she teases out universal themes and relates them to all of us. I listened to the audio version, so there is much I did not catch (a hazard of audio books), but I enjoyed it enough to covet a paper copy for my shelf, one to dog-ear and underline. From her early discussion of “nostalgia” (did you know homesickness was once considered a medical condition?) to her closing chapter on our forever Home, this is a great exploration of the human condition. Called. Fast paced, thought provoking, entertaining, and scattered throughout with great nuggets. Pemberton is a great storyteller, and a very likable protagonist. You have the feeling he and his wife would make great friends. 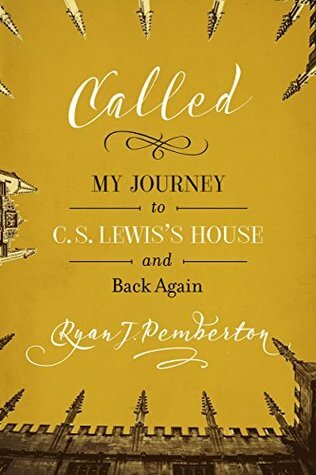 There are plenty of Lewis stories for Narnia lovers, publishing misadventures for aspiring authors, and reflections on discerning God’s will for anyone. Another one to keep and refer back to (or re-read) in the future, whenever the idea of following God in crazy directions is daunting and the way forward is unclear. Many thanks for the generous review, Catherine. I was grateful to stumble upon it! Thanks also for the introduction to Jen’s book, Keeping Place. It sounds wonderfully timely. Grace & peace! You are so welcome! I loved your book. We will be back in Oxford this summer, this time bringing the kids. What a place!